Stanoxyl Depo – a steroid hormone, is very common in high-speed sports, and those sports that require strength, and preferably without a marked increase in weight. In these sports, it is one of the main drugs used. Stanoxyl Depo anabolic activity is 3 times higher than testosterone. Stanoxyl Depo androgenic activity is 3 times lower than testosterone. Stanoxyl Depo differs from the other injectable drugs that are dissolved in water, rather than oil. Steroids dissolved in water have a short half-life, they begin to act quickly, but are not for a long time. Therefore to inject Stanoxyl Depo is necessary every day, at least every other day. It certainly is not convenient for the majority of beginner athletes, much easier to use once a week steroids dissolved in oil. Stanoxyl Depo has the form of a white liquid, the active ingredient of which sinks to the bottom of the vial when the vial is put a while at rest. Stanoxyl Depo is a derivative of dihydrotestosterone and therefore practically does not aromatize. The main area of ​​use Stanoxyl Depo in bodybuilding is to prepare for performances. As you know in this period, the athlete need to get rid of excess fat and Stanoxyl Depo functions is, at a low-calorie diet, to maintain muscle mass from destruction due to lack of calories, fluid reduction in the body, increased vascularity, enhance the action of other drugs in combination make the muscles hard and gorgeous bump. If you are not a professional bodybuilder and your weight is up to 90 kg, and you just want to get rid of excess fat, while retaining most of the muscle mass, then in most cases it will be enough Stanoxyl Depo solo in a dose of 50 mg per day in any form, depending on the desires of funds and putting injections every day. But for the high level performances in the competition, only Stanoxyl Depo cycle is not enough, because of the low-calorie diet, plus by accelerating the metabolism of drugs, allegedly thyroid hormone, your muscle mass will be sprinkling. You will need to apply more androgenic drugs such as Trenboxyl, Masteroxyl, Testoxyl Propionate. Dosages for athletes in this stage vary widely, and they will manage it without any advice. It is possible to use Stanoxyl Depo for a set of muscle mass. Beginners will see good results in receiving Stanoxyl Depo, solo, of course with proper training on the cycle, good nutrition and rest. For a more apparent increase in muscle mass, as well as for athletes who are not first-time users of hormonal steroids, one Stanoxyl Depo is not enough. You must add Nandroxyl, different testosterone, Sustaxyl, Anadroxyl. For beginners cycle, is better to forget about the combination of Stanoxyl Depo with Sustaxyl or Anadroxyl, and use a low androgenic drugs such as Primoxyl, Nandroxyl, Boldaxyl. Such combinations are though less strong, but after the cycle it keep much better results, the cycle will be as safe in terms of side effects and more powerful combination to leave for the next cycles. Stanoxyl Depo has very weak anabolic androgenic action and it is great for girls. Increased androgen in female athletes blood at recommended doses is normal and does not lead to phenomena of virilization. 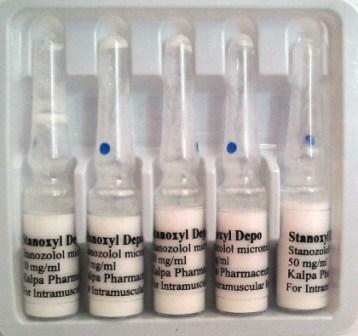 Athletes should use 50 mg of Stanoxyl Depo every two days, but it is better not to risk injections for twice a week. Stanoxyl Depo dosage is used at 50 mg per day, at least every other day. Stanoxyl Depo is not flavored and accordingly when it is used there is no water intake and gynecomastia. Stanoxyl Depo is fairly a safe drug, and rarely with it, you may encounter side effects, if you do not exceed the recommended dosage and duration of use. 5. Damage to the liver only in oral form.